Located 16 miles southeast of Houston, Pasadena, Texas is the second largest city in Harris County and home to 150,000 residents. Its proximity to the Gulf of Mexico means the city receives nearly 55 inches of rain each year, 17 inches above the state median. Combined with Pasadena’s relatively flat topography and poor drainage systems, heavy rainfall can cause flooding and block major highways. During significant rainstorms, the city receives excessive water flow that quickly overwhelms its pumping stations. Most alarmingly, ample flow can cause blockage that affects hurricane evacuation routes. Because of this, the city’s main priority during major storms is to keep the routes clear and passable. 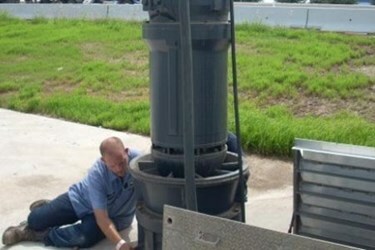 Recently, city officials and the Texas Department of Transportation turned to Grundfos and its line of Axial-Flow Submersible Pumps to solve one such flooding issue that had plagued the city for years. Beltway 8 is one of the few main highways used to evacuate residents from the south and southwest during a hurricane. For decades, the Spencer Road exit has suffered from surface water flooding. On several occasions, the designated evacuation route was left impassable. In cooperation with the Texas Department of Transportation, the city of Pasadena was able to determine that the cause of the flooding was insufficient capacity of the storm drain system. In storm drain systems, flap gates are installed at or near drain outlets to prevent the drainage system from back flooding during major storms. In the case of Beltway 8, the road’s 54-inch storm sewer lacked proper capacity, so a flap gate valve would prevent additional water from flowing back on the road. Problematically, however, that same safety valve would also limit flow into the drain, causing frequent flooding to the roadway that would result in lane closures and extended traffic delays. Pasadena had two options. It could either create a large detention basin or it could increase the capacity of the storm system. Both options required several million dollars, as well as the allocation of real estate and years of construction. Because of restrictions on space, project engineers reconsidered their initial two options. Instead, they decided to route excess storm water around the existing sewer and push it far enough downstream to create adequate capacity. Grundfos’ lines of Axial-Flow Submersible Pumps are specially designed to meet all industry standards. Indeed, Grundfos exceeds those standards in many areas, including mechanical seal design, longer bearing life, unique cable entry system and premium efficiency motors that reduce power consumption and save energy. The energy-efficient line is capable of pumping up to 150,000 gallons per minute and features a compact design, as well as construction cost savings of up to 50 percent. “One of the great things about the Grundfos submersible pump is that you can totally operate it and even check for alarms by standing in front of a control panel, not by sending a man down into a dangerous, confined space,” said Tommy Cook, president of Pumps of Houston. The Grundfos storm water pumping station offered project planners a compact, energy-efficient and cost-saving solution, which for the City of Pasadena, saved significant operation and maintenance costs when compared to similar options. “This particular station, in terms of its capability, its design, its execution and its operation cost about half of what similar pump stations would cost to run and maintain,” Gardemal said. Since the city installed the pumps in 2012, the area experienced a major storm that generated six inches of rain. Amid fears of flooding, the new pumping station efficiently moved more than 30,000 gallons of flood water per minute for roughly five hours—keeping the highway clear and safe. “This storm water pump station, in confluence with Grundfos and Pumps of Houston, has solved a decades-old problem of flooding in this region,” Gardemal said.